Talk was hosted by new group called Grazing and Conservation and was a look back and forward. On any given day during the growing season, Matthew Dix is likely to be out on a Martha’s Vineyard Land Bank property with a herd of goats tightly penned together. The goats will be hard at work, munching away at scrubby growth until the patch is nibbled to the quick. Then the pen is moved, and the goats begin browsing once again. The land bank acquired the goats two years ago to replace mowers in the management of some of their properties. Though a herd of goats is more expensive than a mower, it protects species like box turtles and ground nesting birds while targeting hard-to-reach spaces like stone walls. Using grazing animals to maintain properties also opens the door for cooperation with Island farmers. Right now, the land bank has their own herd of 200 goats. In the future, Mr. Dix would like to find a way to share the livestock with farmers. The land bank goats were an example of the mixing of agricultural interests and conservation efforts shared at a talk Monday night in the Agricultural Hall. 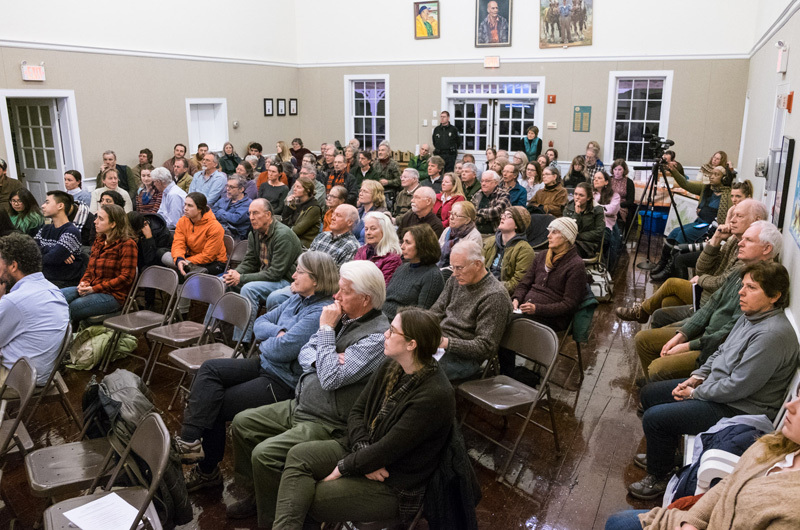 An emerging Grazing and Conservation community group hosted the talk to explore ways farmers and conservationist can work together to shape the Vineyard’s future. Vineyard landscape is marked by the history of its use. Open meadows and young forests tell a story of a rise and fall in agriculture. In the 1600s, when the first European colonist arrived on the Vineyard, the land was deforested to make way for large pastures for grazing purposes. By the 1850s, when agriculture changed and declined, the pastures were abandoned and scrubby growth provided a new ecosystem for grassland birds and uncommon native plants. Over the years, secondary forest growth covered much of the land, though some meadows have remained open through continued management. With a finite amount of land on the Vineyard, the balance of agricultural and conservation land has always been of interest. 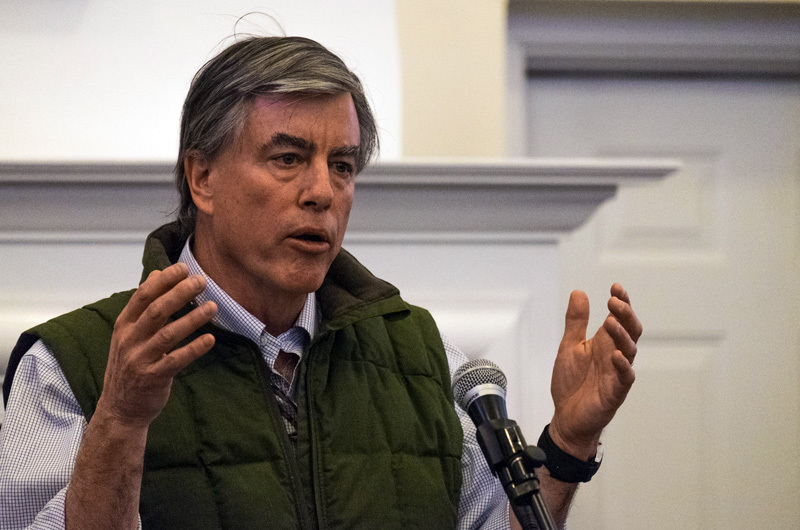 David Foster, ecologist and director of the Harvard forest and one of the speakers at Monday’s event, said that in the 1860s there was a prize at the Agricultural Fair for growing the best plantation of pitch pine to reforest the plains. Mr. Foster’s recent book, A Meeting of Land and Sea: Nature and the Future of Martha’s Vineyard, examines the Vineyard through the long lens of the land including its geology, ecology, history and culture. 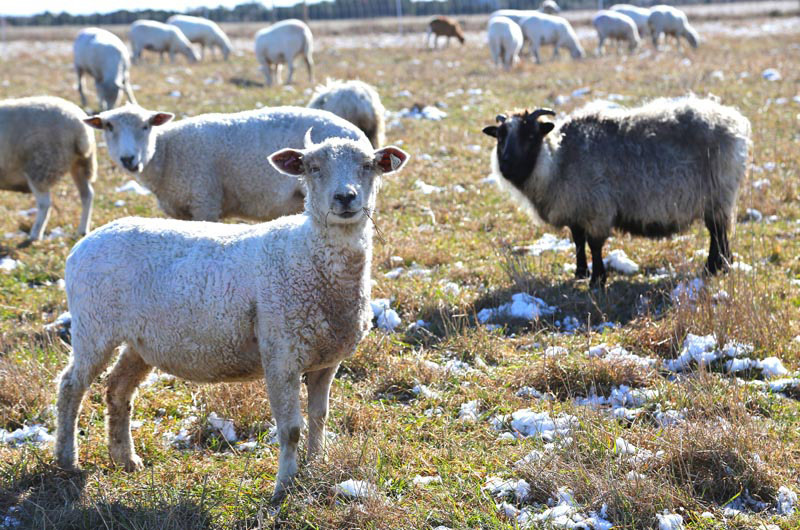 Additional examples around the Island of collaboration include Allen Healy’s sheep grazing the fields at the Polly Hill Arboretum, and Slip Away Farm and Grey Barn Farm operating on land owned by conservation agencies such as the land bank and the Trustees of Reservations. But members of the conservation and farming community see room for more. According to calculations done in the Island Plan, four to seven per cent of food eaten by year rounders is currently produced on Island. Brian Donahue, a professor at Brandeis University, countered that New England could reasonably produce 50 per cent of its own food with 15 per cent of the land devoted to agriculture. Currently, there are about 1,690 acres of agricultural land on the Vineyard and 690 acres of cleared land. Jon Previant, general manager of the Farm Institute, asked the crowd where that land would come from. “If we’re going to eat locally we have to grow locally,” he said. He pointed to Thimble farm’s aquaculture project as one way to increase food production without requiring large tracts of land. However, aquaculture and greenhouse growing only works for produce. Livestock needs land. Mr. Previant suggested the Island take better advantage of wooded land for possible grazing purposes, however these areas do have drawbacks as the animals can escape and wreak havoc on the neighbors or vernal ponds. “My good friend reminded me yesterday of the saying, the woods are a poor man’s barn,” he said. In addition to suggestions, Mr. Previant had more questions. There were no concrete answers delivered Monday night. Rather, it was the beginning of a discussion that will eventually result in a report put together by the Grazing and Conservation program. Though his presentation was driven by questions, Mr. Previant said he sees a bright future for conservation and agriculture. “My optimism tells me there will be some specifically Island way of figuring ourselves out of this mess we figured ourselves into,” he said. Don't forget about shellfish farming. It requires zero land, zero fresh water, there are no added chemicals, and zero food or nutrient inputs of any kind. Everything the shellfish need to grow is already present in the environment. It also improves the local environment it is grown in by providing water quality benefits and habitat which encourages the proliferation of local marine species. Shellfish farming is THE MOST eco-friendly, sustainable way to farm protein on the planet. 100% organic.